Background: The back of the head appears to be a non-descript skull area that usually garners little attention. And this is true as long as it has a relatively smooth slightly curved surface contour. But when protrusions occur its obscure appearance can become an aesthetic distraction. Such is the case in the classic occipital knob skull deformity. 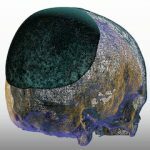 The occipital knob, or anatomically called the inion, is a midline bulge of bone on the most inferior edge of the occipital skull. In most people it appears as a slight bulge of bone that is completely obscured by the very thick overlying scalp tissues. But in some people it become enlarged and sticks out beyond the inward convexity of where it lies. 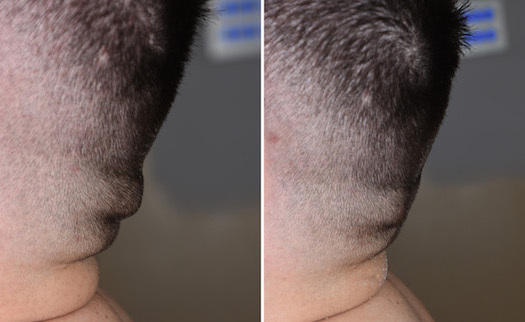 This appears as a bulge or protrusion at the bottom of the occiput which is easily seen in men with short hair or shaved heads. The exact reason it becomes enlarged is not known although it is almost an exclusive male skull feature. 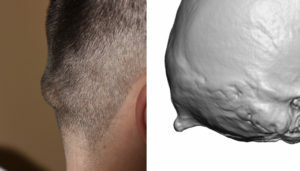 Case Study: This young male was bothered by a prominent occipital knob that appeared as a raised midline area on the back of his head. With his short hair cut it was particularly noticeable. Under general anesthesia and in the prone position, a 3.5cm incision was made in a horizontal skin crease that always lies right below the knob. Through one inch of thick scalp tissue the bony knob was found and dissection was done all the way around it particularly on its underside. It is important to get on its most inferior surface (underside) if adequate reduction is to be achieved. Using a high speed handpiece and burr, 15mms of bone was reduced…all of which was cortical bone. His immediate intraoperatuve result showed complete elimination of any visible protrusion. 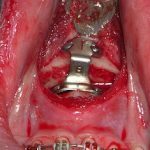 The key in doing so is to carry the bone reduction down and under, following the convex curved shape of the back of the skull. Such a small scar incision heals with a virtual undetectable scar. 1) The inion or occipital knob can become enlarged and stick out like a ‘knob’ on the back of the head. 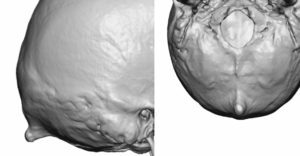 2) 3D CT scans demonstrate that the enlarged inion disrupts the smooth convex contour of the lower end of the occipital skull as it head towards the foramen magnum.